According to the legal scholar Smithson, anything that appears on his website can't be "reproduced or referenced in any way" without permission from Smithson himself. The mere mention of the contents of a Smithson post would be a violation of his "copyright notice." Smithson's little "notice" also seems to include the countless other articles he cut-and-paste from various sources. When did Smithson acquire the authority to determine who can and cannot reference material from such sources as The Daily Caller, Politico, The Wall Street Journal, Fox News, or World Net Daily, to name a few? Chances are never. Smithson's copyright notice doesn't even hold water when compared to Smithson's own standards for copying material. 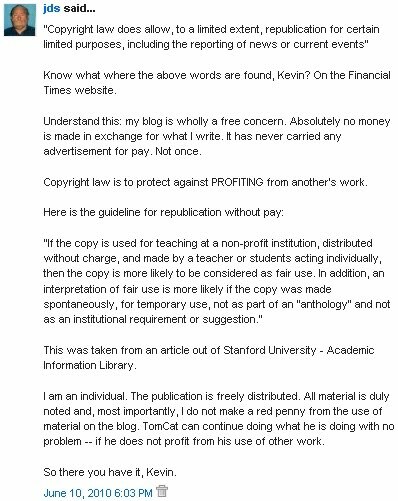 If you recall, I had written an article back in June that outlined Smithson's blatant violation of The Financial Times' copyrights, in which Smithson responded defending his position. I thought that as long as I linked back to your website or published an attribution, that there are no restrictions on how I can use your content? This is not correct. Merely providing a link or an attribution is not a defence to copyright infringement. Why does it matter if I copy FT content without permission? Unauthorised copying is a way of avoiding paying for the value you are gaining by using the content. We make a significant investment in creating FT content to deliver value to you and to make a return on that investment. If we are unable to protect that investment by licensing our content and collecting revenue, then it threatens our ability to continue to create the content. So, I guess it would not be a "violation" to write that on July 19th, Smithson wrote an article stating that both liberal and conservative pollsters are now predicting even greater losses for the Democrats come November. The article Smithson quotes has Democrats ending up with 53.4 Senate seats compared to 46.1 Republican-held seats. Smithson calls this "good news." It would also be a "violation" to reference this other Smithson article from the 19th, in which Smithson mentioned a study that questioned whether the Obama administration considered job losses from automobile dealerships when they pressured bailed out manufacturers to reduce costs - Smithson combines the job losses from the dealerships with manufacturing jobs, resulting in a total of 68,000. Smithson fails to understand that without the bailout, the losses would have been far greater. If GM were to close its doors, imagine the job losses then. The only thing that I can agree with Smithson about is the unnecessary closure of auto dealerships - while some probably would seem redundant on paper, I never quite agreed with just how the dealership business model works. Before I go any further, let me clarify a bit as to why John Smithson was wrong when he defended his copying of The Financial Times and why John Smithson is wrong now. With his plagiarism of The Financial Times, Smithson claimed that all was good because he was not profiting off of the other persons work. He also claimed that the information was freely distributed and that he was using it for educational purposes. Smithson was trying to apply bits and pieces of the law to describe his copying as "fair use, but he couldn't be more wrong. I had given Smithson a detailed response back in June and he still didn't get it. As I had written before, The Financial Times required registration to view their articles, where there were paid advertisements. Smithson's post circumvented registration, allowing readers to view the article without registering with The Financial Times. This would be like paying for cable and then running a line over to your neighbor's house - for free. What was Smithson's response? Your argument that I detract from the profiteering of the Financial Times shows that you know nothing about that site. I read from a free site and am a registered member of that site. No stealing is involved but who cares. Slander is what you do. You can quote all you want. I read the info page at the FT last year and my lawyer son has confirmed my understanding of copyright law (in this case). The FT article was used as a teaching tool (by me) and, in that light, can be used for that reason, as well. You will continue to use the word "opinion" but, of course, everything we say is an opinion. Do we conclude, then, that "teaching" is not possible ?? Copyright law IS there to protect against profiteering off the work of other's. Other purposes exist, of course, but that was the original and prevailing reason for such laws. He fails to understand everything - even that slander is spoken, not written. I had even mentioned the four-factor balancing test, as found on Wikipedia, that explains whether or not a citation is considered "fair use." Smithson was only focusing on numbers one and four. One would be required to consider all the factors when citing a work. 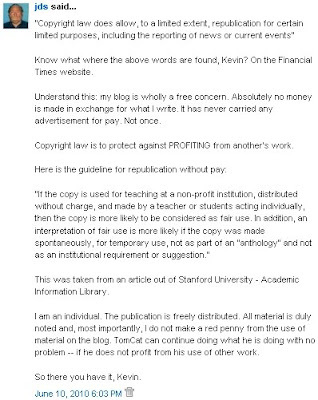 He failed to take into consideration the nature of the copyrighted work (an article accessible by registration to a service), the amount of the article copied (his posting of the entire article), and the effect of his use upon the market value (his "nonprofit" use can potentially steal revenue from The FT). If the copy is used for teaching at a non-profit institution, distributed without charge, and made by a teacher or students acting individually, then the copy is more likely to be considered as fair use. In addition, an interpretation of fair use is more likely if the copy was made spontaneously, for temporary use, not as part of an "anthology" and not as an institutional requirement or suggestion. Smithson only looked at the first sentence, failing to understand the second half. It really can't be one or the other. I remember a couple years back I took a course at Rollins and a professor wanted to include as teaching material a couple photocopies of some articles found in some industry publications. The school had to get permission, and even then, they were not allowed to publish it freely - I had to pay an arm and a leg for a couple magazine articles so that the owner would not lose any money from the free distribution of their work. I also wanted to point out that Smithson, a conservative activist, who has made accusations against this website, calling its authors "socialist" or "Markist" was himself supporting a socialist idea - that information should be freely distributed regardless of ownership. 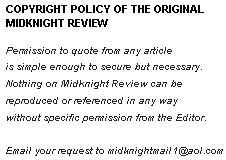 The fact of the matter is that the reason why Smithson's citation was a violation of law was because he copied an entire article when the original author specifically stated not to - even when he quoted one part of their policy that supposedly backed his position, he conveniently ignored the following sentence that would prove otherwise: "Unless your use of our content is permitted by this Copyright Policy, it is likely that we regard it as 'unfair' and a breach of our terms and conditions." The problem with conservatives like Smithson is that they want to control the flow of information - just consider the tactics of Andrew Breitbart who is constantly trying to sway the media with his "journalism" or Sarah Palin who only attends events sympathetic to her and restricts media access wherever she goes. Why do these individuals want so much control? I think it is because when presented to the entire population, a majority would be skeptical of any comments made. What would the American public have thought of about the James O'Keege and Hannah Giles ACORN videos if they were released unedited and in their entirity? Apparently, the Brooklyn DA didn't think much of them. The right attacks the "mainstream" for not covering their stories, but when you consider their stories, like the one claiming the Missile Defense Agency logo was proof America was heading towards Shariah law, then you would understand why there is the desire for such control. Conservative politicians depend on such journalistic trash to invigorate the base, but they walk a fine line when presenting themselves to the general electorate - just look at what happened with Palin's recent Ground Zero mosque comments. Smithson's copyright notice is silly, and is just not enforceable. Maybe he should consult with his lawyer - you know, the one who supported his plagiarism of The Financial Times - on this matter, but then again, I don't think that will do much good. Smithson still believes that this website is slandering him, even though the correct accusation would be "libeling," and he still insists ownership over all things under the sun that may relate to his site. Who does Smithson think he is? If I was him I'd get a new lawyer and fast before he does something that could actually get himself involved in legal proceedings. Preferably a lawyer from an accredited school this time. At least one that required more than 2 years of education total...that's me being generous in assuming it would take as long as a sophomore in college to know the difference between slander and libel. Here is a great FAQ regarding copyright infringement. I suggest Smithson visit this rather then operate off of the advice of his two-bit lawyer.